Not satisfied with the first ethnic ring (previous entry), I made another one here. 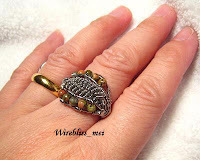 This time its smaller and suit my finger nicely. 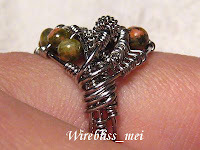 Still there is a small mistake made on the two center wire coils. They are way too short. Miscalculation on my part. They lie too flat making the ring looking rather flat top. This time around I managed to complete the ring in under 3 hours. 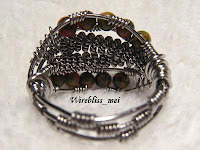 Am thinking of a third one already -- more in trying to improve the two center wire coils. Mei this is really gorgeous! Always enjoy looking at ur pretties!!! keep up the great work. I really enjoyed myself making these two rings. Thanks for looking and have a great holidays. Merry Christmas.